Home Dessert Vancouver Cheesecake etc. 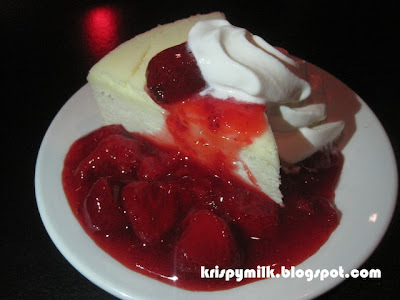 I've heard for years that there's a really famous cheesecake place under the Granville St. Bridge, but I've never had the chance to try it out. So I was quite excited when a friend suggested Cheesecake etc. for dessert. The place was packed full and the lighting was so dim that I could barely read the menu. There were only 2 different types of cheesecake: original and chocolate with the option of adding strawberries. I thought that the original ($4.50) would be a safe choice, considering the good things I've heard about the cheesecake here. I have to say I was a bit disappointed when it came. I had expected much better presentation. 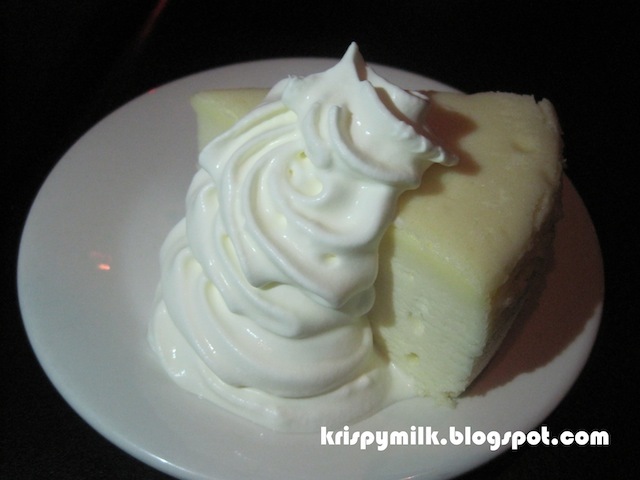 The cheesecake was pale yellow and completely plain, served with a huge dollop of whipped cream. I found the presentation quite unappetizing... I would have overlooked that if it tasted great, but it was average at best. The texture was much lighter than that of regular cheesecakes and a bit heavier than Japanese style cheesecakes. It felt rather insubstantial and pretty much disappeared the moment I put it in my mouth. I guess that's what people like about it, but personally I think that cheesecakes should be heavier and richer. My friend got the original with strawberries ($5.50), so I got a picture of that as well. It didn't look any more appetizing than mine... It was the same thing sitting in a pool of strawberry sauce with soft squishy strawberries that didn't taste very fresh. And the most ridiculous part was that they actually charge for hot water here! I asked for hot water at the beginning of the meal and there was no mention of an extra charge. I didn't know until we got the bill, and it was billed as "hot water with lemon and honey" ($1.25). They never even gave me the lemon and honey! I talked to the waiter and was told that hot water must be ordered with lemon and honey and that I had to pay even if I wanted just hot water by itself. I did end up getting the charge removed, but this is the only place I've been to that refuses to give hot water for free.